For most Australian businesses, increasing productivity in the workplace is a common goal. In a truck workshop, for instance, productivity is measured in terms of the rate of output per unit of input. This means getting trucks in and out as quickly as possible. Designed to exacting standards, Portalift heavy vehicle hoists offers a lifting system that is simple to operate and allows complete underbody access for fast and efficient maintenance of your fleet. 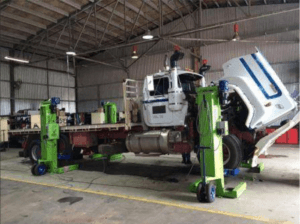 By raising a vehicle on a heavy vehicle hoist such as Portalift, technicians will have much better access to “trouble spots” such as the suspension and other areas, as compared to when the vehicle is simply raised on a jack. Your technicians will also be able to work on a lifted vehicle while standing up, rather than having to lay flat on a creeper. This also makes it much easier for them to access hand tools and other necessary auto service equipment more quickly and efficiently. 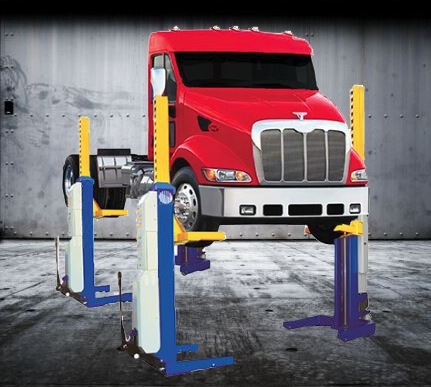 With a more versatile heavy-duty lift, your workshop will be able to service commercial trucks without the need for long downtime periods. This means your technicians will be able to get it up on the lift and ready for servicing in a matter of minutes. When you choose a hoist that incorporates advanced technology in their design, this makes asset management more efficient. 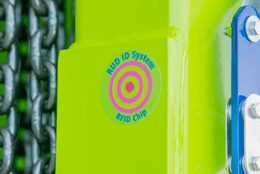 For instance, Portalift Hoists have the latest Radio Frequency Identification Device (RFID) chip installation. Each hoist has a unique chip number, meaning a fleet of hoists can be tracked easily and efficiently. You can also take advantage of this technology to track your service records or operation manuals. Ask us how! Portalift hoists are the most economical on the market to maintain. Annual service requirements and general maintenance can be performed in-house, we’ll show you how! One thing we’ve noticed over the years is that auto technicians will actively seek employment in a workshop that’s fitted out with the best equipment. This is because they know that by working with the most modern, up-to-date vehicle servicing gear, they’ll not only add to their skills, but also have the best chance of career success. As Portalift is utilised by training institutions across Australia, such as the Bendigo Kangan Institute, your current and future employees would more than likely be familiar with its operations. Equip your workshop with high quality heavy vehicle hoists, to not only give yourself the best chance of attracting more talented employees, but also retain them for longer. This can save your business the time and money used to find and train new employees. At Endurequip, we understand that you always have an eye on productivity and the bottom line. So to make sure your workshop is performing at its best in both areas, choose quality heavy vehicle hoists from Endurequip and help your technicians do more in less time. To find out more about our heavy vehicle hoists and how we can help make your workplace safer and more efficient, call Endurequip on 07 3809 1399 or use the contact form here. 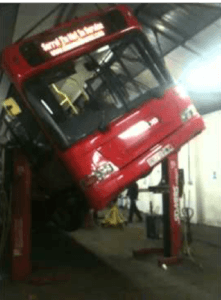 Whether you are working with truck, bus, defence vehicles or are involved with custom lifts, selecting the right heavy vehicle hoist is one of the most crucial decisions you could make. Utilising the best possible hoist is key to your business’ success and employee safety. Unfortunately, many people don’t make the best decision when it comes to selecting a heavy vehicle hoist. This could be a costly mistake. Wireless hoists attract many consumers as they are marketed as the latest, most modern technology- but they may not be worth the risk in the long run. 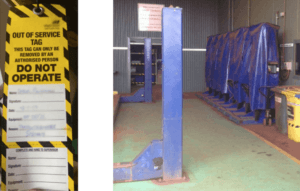 We often receive calls from companies that have had bad experiences with wireless hoists, such as breakdowns, which have impacted the productivity of their workshop. This is especially noticed in rugged environments such as mines, washbays and rural areas. Therefore, these companies frequently switch to Portalift for business reliability of getting the job done. Some wireless hoists are not built for rugged environments. 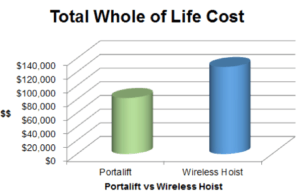 Wireless Hoists have almost double the total whole of life cost. Many wireless hoists are only rated at IP55, which means they are not able to withstand the harsh Australian environment and are more sensitive to elements such as water and dust. Ultimately, wireless hoists have a shorter lifespan which means that your business will eventually have to part with more money for a replacement set of hoists sooner. Wireless Hoists sometimes break down. As wireless hoists are less heavy-duty, they are more likely to breakdown, effecting the productivity of your business and potentially costing thousands of dollars in repairs. Plus, there’s very little information available on how to maintain a wireless hoist, therefore there is increased risk of incorrectly carrying out servicing safely and correctly, leading to added costs and a reliance on outside ‘experts’ for ongoing maintenance. Wireless Hoists require a battery change every 2-5 years, therefore, the replacement of batteries can be costly as well as unfriendly to the environment. These batteries also need to be recharged often which is inconvenient and may steal time away from a productive workshop. IP65 rated: Portalift Hoists are dust proof and water resistant. As a result, they can be set up anywhere and are especially suitable for long term use in rugged environments such as mines or wash bays. In fact, Portalift Hoists are exclusively used by the Australian Defence Force, as they are rugged and reliable enough for field deployment. Less wear and tear: Due to the durability of Portalift and the fact that the hoists are equipped with a unique chain drive, this results in less wear and tear, meaning the Portalift system is less likely to breakdown, saving money and maximising productivity in the workshop. Lifetime Manufacturer’s Warranty: Portalift Hoists are higher quality, with a design life of 25 years and backed by a lifetime manufacturer’s warranty, leading to less whole of life cost. 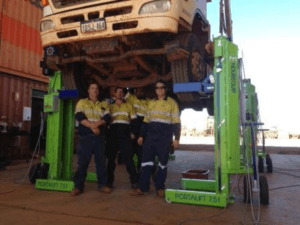 Reputable: Portalift Hoists are utilised by training institutions across Australia, such as the Bendigo Kangan Institute in the Automotive Centre of Excellence, meaning that your current and future employees would be more than familiar with its operations. Technicians can carry out servicing correctly and safely without having to rely on external help. 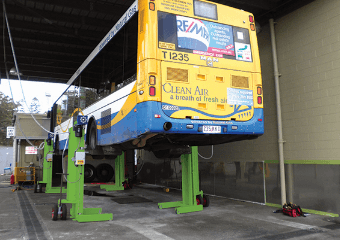 This is why Endurequip’s Portalift Hoists are trusted by small businesses as well as leading bus, railway and road transport companies throughout Australia, Asia and the South Pacific. Our product specialists can help you evaluate your heavy vehicle maintenance needs and help determine the best equipment you need. Talk to them today! Call us on 07 3809 1399 or contact us here. When you have a heavy duty task, you need your equipment to be just as heavy duty. Quality is one of the most important points to consider when selecting a heavy vehicle hoist. A hoist that includes the highest quality RUD Chain can significantly increase the lifespan of the product, requires less maintenance and provides greater safety to your employees, thus saving you money in the long run and boosting productivity. Increased durability – Our Portalift hoists have a design life of 25 years! Flexibility – Each system is completely dust proof and water resistant, which means you can set up anywhere (IP65 rating). Less Maintenance – Features like our special RUD calibrated high quality chain drive mean less maintenance and less wear on your equipment. So you can keep right on working without any break in productivity. Strong – Endurequip hoists are designed to anticipate every heavy vehicle scenario and address it. All of our Hoists are entirely Australian made. In fact, we are the only Australian made heavy vehicle hoist manufacturer. They come with a Lifetime Manufacturer’s Warranty and ongoing local service and support. So let Endurequip do the heavy lifting for you. Creating a safe work environment is a legal requirement and critical to your long term success. At the end of the day, your team is your most valuable asset and safety should be at the forefront of everyone’s minds when selecting a hoist system. Protecting your valuable team members is the highest priority for Endurequip. That’s why our products feature every safety consideration possible. All of our heavy vehicle hoists come equipped with a constant safety system which is independent of the drive system. A keyed safety lock and meet with all Australian and New Zealand safety standards. Dual control options, both “on post” and remote, give you the choice of where you want to be, safely. Why make things harder than they need to be? A complicated hoist system is your worst nightmare as more technicians have to work on the system and installation takes longer than it needs to be leading to loss of money, time and productivity. Portalift hoists are designed to make your life easier. The compact structure can be quickly moved to any location with no installation. Our clear control panels let you configure your setup exactly how you need it. Our systems are electric rather than electronic, so you don’t need a specialist to understand it. Being simple doesn’t mean you have to lack in cutting edge engineering. Portalift Hoists have the latest in design features, including Radio Frequency Identification Device (RFID) chip installation. You can take advantage of this technology to track your service records or operation manuals. Ask us how! Flexibility inside and outside your workshop cannot be understated. A flexible solution saves time, money and increases productivity. This is why we’ve designed Portalift system that makes it easy to utilise inside or outside the workshop with no installation required. Plus, because it is completely mobile, the system can be relocated to another work site or new premises if required. A remote pendant control and all hoists have on post control allowing for independent hoist operation. Fully portable hoists that can be quickly and easily moved to any area of the workshop floor for immediate use. Complete mobility of movement. The hoist posts can be raised or lowered individually, in pairs or all together. With Portalift hoists and accessories you have a complete workshop solution! Lastly but certainly not least, when selecting a hoist make sure to find out who has used the hoists and how it has improved their operations. Don’t just take the company’s word for it! Portalift hoists are relied upon by leading heavy vehicle manufacturers including localand state governments, major mining and railway companies. Rugged enough for field deployment, dustproof and waterproof, Portalift has been used extensively throughout Australia by the Australian Defence Force since 1993, and is also now in use by the New Zealand Defence Force. 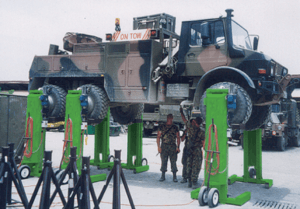 Endurequip is The Australian Defence Force’s only supplier of portable heavy vehicle hoists. Fill out our easy form and we will be in touch soon with a tailor made quote. 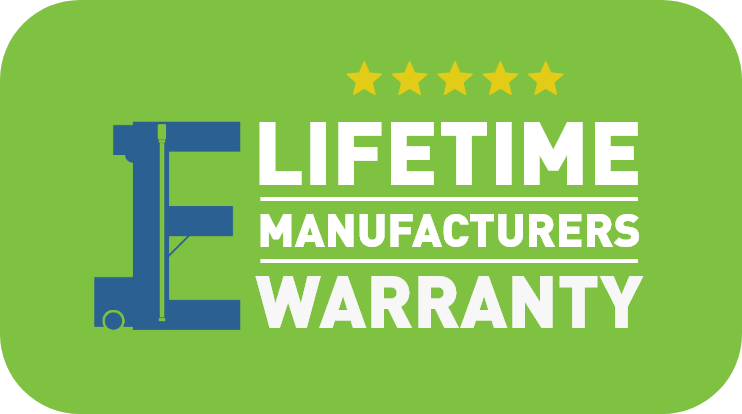 We are so confident in the quality of our products that we offer a lifetime manufacturer’s warranty. OR Contact us to learn more.